Filling: Beef, water, spice mix (spices, garlic powder, onion powder, yeast extract, salt, dextrose), soya protein, salt, soya protein isolate, potato starch, onion flakes. Wrapper: Wheat flour (cereal containing gluten), water, frozen whole egg and/or frozen albumen, modified corn and/or wheat starch, salt, vinegar, sodium propionate, sodium stearoyl lactylate, potassium sorbate. Allergy alert: Wheat, egg, soy. Pre-heat frying oil to 375°F (191°C). 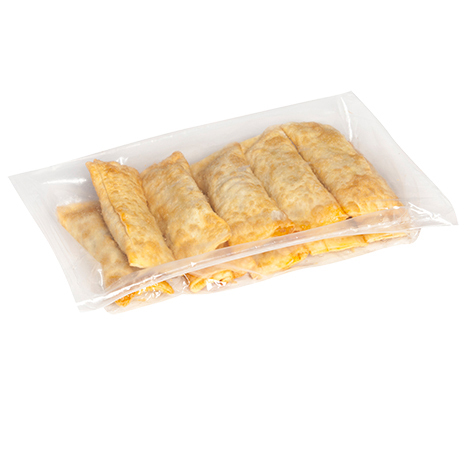 Thaw donair egg rolls, or microwave frozen egg rolls on high for 30 seconds. 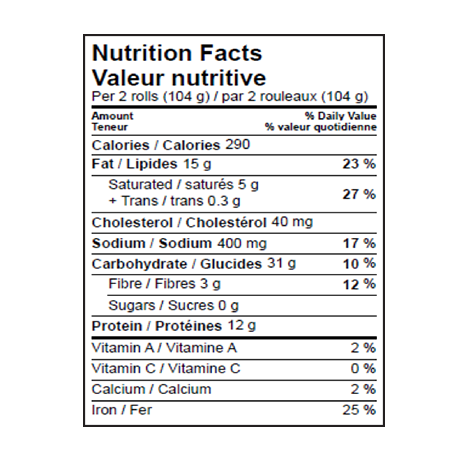 Deep fry donair egg rolls for 2 1/2 minutes (heat meat to internal temperature of 165°F (74°C).